Aldi has become the latest retailer to bump up its low alcohol range with the addition of four new 5.5% ABV wines. It has added the new Featherweight collection, available in Sauvignon Blanc, Pinot Grigio, Merlot and a White Zinfandel rose wine (RRP: £2.99), to the range in response to growing consumer demand for lower calorie, lower alcohol wines, it said. According to Nielsen data, the no- and low-alcohol category is in growth, with values up 39% during 2016 (in the 52 weeks to 10/09/2016). Low alcohol wine is defined wines with an ABV of 0.5 – 5.5%, with wines between 5.6%- 15% ABV being defined as ‘lighter alcohol’ wines. 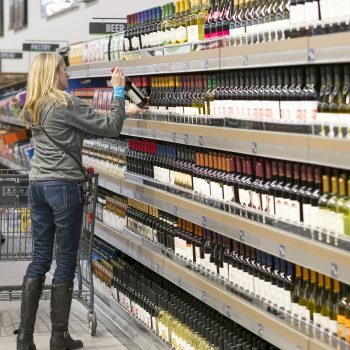 The move follows Tesco, who upped its focus on no- and low-alcohol wine category in March, rolling out a new dedicated bay for wines after admitting it would be “silly to ignore” the growing category. It later followed with three new de-alcoholized wines of “comparable quality” to their boozy counterparts (0.5% ABV) from Spanish producer Felix Solis. At the time, Tesco’s Master of Wine James Davis said the demand for lower and no-alcohol drinks had grown among consumers and wine had been “firmly left in the shade” by the improved quality of the beer and cider offered on shelf. In December last year, Lidl also unveiled a lighter alcohol wine selection in its New Year Wine Cellar collection, with five products clocking in with an ABV of less than 12%, one, a Portuguese Rosário (RRP: £4.49) with an ABV of 10.5%. I recently read about the growth of non alcoholic wines and I must admit I was just curious. So I ordered a couple of bottles and for me the only one that tasted like actual wine was those from Arial Vineyards. However, that’s not to say I can’t wait to try some more.